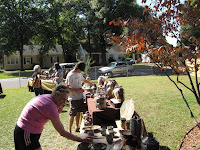 Sunday was a busy day at Clayworks. I got there at about 8:30 a.m. and planned on getting TONS of work done. 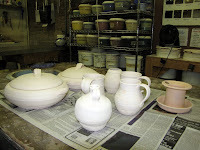 I had to glaze some pots, and then I wanted to throw some large pieces and possibly paint some cone 5 work. 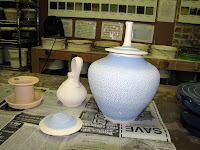 I only accomplished the glazing portion of my plans --and I was there until 5:30 p.m. My glazing ALWAYS takes longer than I think it will, especially now that I am dipping, and then spraying several different layers. 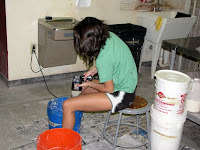 Since the Clayworks annual meeting was taking place later in the day, I helped Maggie move equipment and tables. I changed some light bulbs (one of the curses/advantages of being tall), and helped moving more furniture. 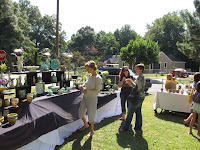 This was the first Clayworks annual meeting I had ever attended and it was great. Things are apparently going fairly well for such a down economy. Enrollment is up and we are in the process of looking for our own building. I am constantly amazed at the people around me and Sunday was no different. They never cease to surprise me with things I would never have thought were possible. When Adrienne was running down the list of requirements for the new building, one item almost knocked me off my stool: air conditioning. The plans are to have air conditioning at the new building. I had no idea that was even an option, but I will be taking full advantage of it in the future. Our lack of air conditioning makes summers almost unbearable in the studio. 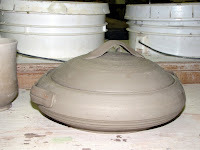 Lately my need to make pots has overridden my need for comfort, but it is usually like a sauna in the summer time. Between the air conditioning and the loading dock, I'm a more than happy camper. Exciting times indeed. Thanks, Adrienne! 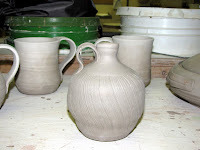 One of the great things that was shown at the meeting was a new booklet featuring the history of Clayworks. It was obvious that Jan spent a lot of time putting this impressive document together. It's not only a wonderful thing to have, but also an invaluable tool when applying for grants. Thanks, Jan! Ann was also responsible for bringing the home made red velvet mini cupcakes and the mini cheesecakes and let me tell you, they were phenomenal. I have been the happy taster of Ann's baked goods in the past and know how wonderful they are, but she really outdid herself on Sunday. Thanks, Ann! 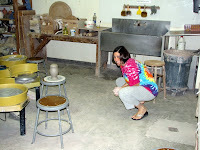 Shari checking out her pot. Elaine and Scott hard at work. The big gas kiln was firing on Wednesday and Greg was checking the progress of the cones and the reduction. I was lucky enough to be there and had my camera handy (go figure, eh?). 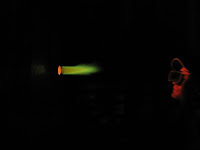 The back pressure gave us a nice green flame coming out of the peephole. We do some pretty awesome reduction in that chamber and I have been one of the lucky recipients of the carbon deposits on more than one occasion. Flame on. Greg checking the cone progress. I also finished body work on my teapot. I am excited about this teapot since it is the first one I've done using a bamboo handle. 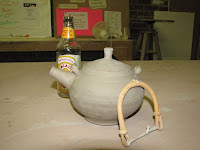 Teapots are a lot of work and this one's got a ways to go yet. 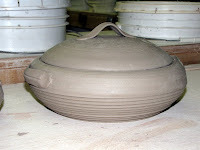 Body, lid, spout, handle, glazes, etc. Many pieces, many options, many variables equals many things to go wrong. Still, I need to make many more of them to get more comfortable with the process. Remember: It's all about the process. Teapot with future bamboo handle. Saturday we went to UNC Asheville and took the tours. It's a a great school with a widely varied curriculum and a small student population. It's very highly rated nationally in several categories. They actually encourage students not to pick a major too soon so they will have time to try as many things as they want before settling on something. They also like it when students pick seemingly unconnected subjects, like chemistry and art. They are invited as undergraduates to pursue research in any field they choose. Another nice feature there is that even as freshmen they will be taught by faculty members, not graduate students. I was VERY impressed by UNCA and wish I was going there. It seems like the perfect school for me since they encourage you to dabble in several different areas. It suits my A.D.D. perfectly. 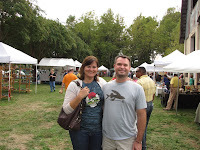 After the tour Karen and I went to the 62nd Annual Southern Highland Craft Fair which was conveniently scheduled for this weekend. 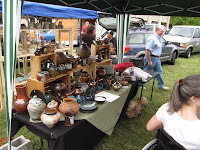 We saw inspiring work from many potters and lots of other crafts. 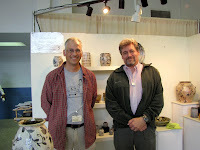 I saw Steven Forbes-deSoule again and drooled over his work just as I did at the Mint show. 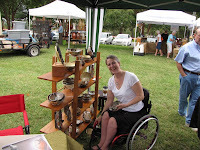 I also met some potters that I have only known through their blogs up to now: Michael Kline, Joy Tanner, and Kyle Carpenter. 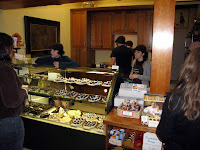 After that we strolled around downtown and hit The Chocolate Fetish for some delicious chocolate goodies. We also visited some galleries --one was in an old Woolworth's building (complete with lunch counter) and another was in an old JC Penney's. Nice re-use. Michael Kline and yours truly. 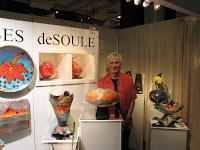 Steven Forbes-deSoule and his raku. 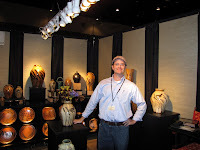 Kyle Carpenter and his gas/salt fired pieces. 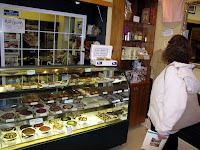 Inside, it's all about the chocolate. 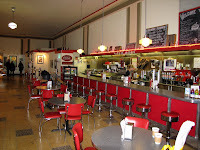 The lunch counter at the old Woolworth's. 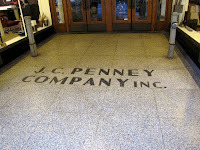 The entrance to the old JC Penney store. 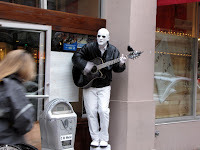 The statue man (who sings). I thought I'd look for a long MKM rib while I was there, but the only long rib they had was this REALLY long one. Oh well, I bought it anyway. We'll see how it works. 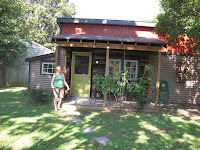 Asheville is a great town full of creative people and fun shops and galleries. I wouldn't mind making regular visits there to enjoy the atmosphere and people. If you haven't been, you need to go. If it's been a while, you need to go back. If you live there, I'm jealous. One thing I need to mention about Bob Dylan's Christmas Album is that all proceeds from the album's sales go to support Feeding America, The World Food Program and Crisis UK. BrandX: Tangled up in Tinsel? You may have heard the rumors, but it's true. Bob Dylan has released a Christmas album. 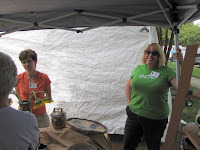 On Saturday Elaine, Becky and I took our show on the road again to the Carolina Clay Matters Guild Barn Sale. 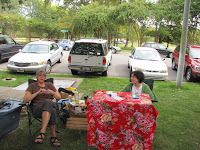 We had a great time, had a nice picnic snack, built a fort in case it rained, and even sold some pottery. I am truly blessed to have the best boothmates ever. We all work together to get things done and have so much fun it should be illegal. 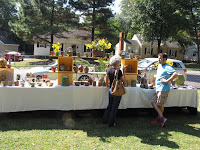 I am always amazed at the talent that surrounds us and the barn sale is a showcase for that talent. 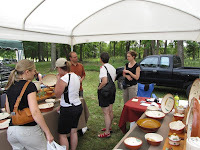 When I visit a sale like this I can have one of two reactions: I can get depressed by seeing everyone else's work or be inspired and invigorated by it. I choose the second option and am planning on going back to the studio to create some amazing stuff of my own. It's nice to catch up with so many friends and make some new ones. With fifty-four artists it's hard to get around to talk to all of them especially when you're supposed to be selling your own work too. I still try. 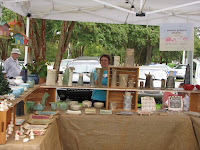 There were quite a few people from Clayworks on both sides of the booths and we were well represented. 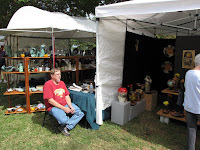 The turnout for the show was good but I think people are still uneasy spending money on non-essentials. 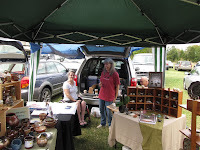 My sales were fair, but given the economic uncertainty they were probably more like "good". that her Dad built for her. Becky's new bird nest boxes. 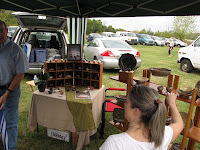 Verna showing her wonderful work. but she was too busy selling. check out his amazing pots. Chris and Robin enjoying the day. Ro and Ju-Ian relaxing in the shade. 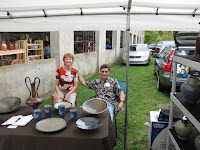 Ron and Sarah selling slipware. Karen and Ralph kicking back. Rae and Michael having a good time. Lisa and David came to visit. 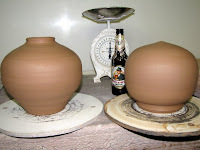 I went to Clayworks on Tuesday and Wednesday to handle some phoenix pots. 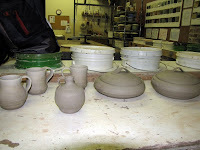 Thursday I was ready to put them on the greenware shelf for bisque firing and took a few pictures. 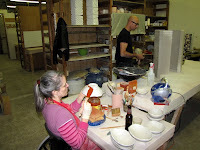 I then threw some new pots using orangestone. 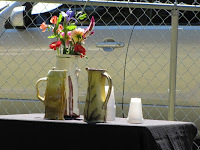 I am still working on some of those closed, flattened bottles. I also threw a fun bottle with decorations, a toothbrush holder a friend requested, and another form I just couldn't get to close. 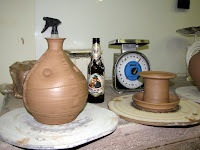 Instead of pressing the bottles when they are wet I am going to wait for them to set up a bit and try paddling them. Still looking for a mug shape. Small bottle from a small piece of leftover clay. The whole group for scale. Fun bottle and toothbrush holder. Ran out of clay on closing the first one. 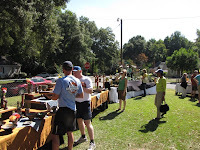 2009-10-05 Monday - Barn Sale on Saturday! 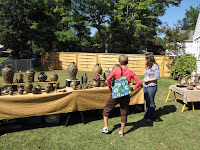 The Carolina Clay Matters Guild Barn Sale is coming up this weekend. 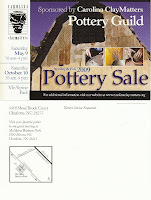 There will be over fifty potters there, including yours truly. 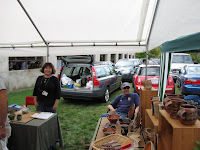 I will be sharing a booth once again with Becky and Elaine. Yup, I've talked them into letting me park in their booth once again. I hope they don't realize that I'm the freeloader and toss me out. But seriously, it's great to be in a booth in such nice and talented company. 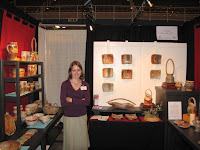 Becky will be bringing her famous flock and Elaine will be displaying her wonderful work. I am honored to be displaying with them. 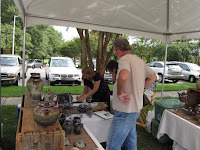 There will be lots of talented artists there on Saturday from 10:00 am to 4:00 pm. If you are in the area, you owe it to yourself to visit this sale. It's amazing. 'Nuff said. You can find a nice PDF version here. 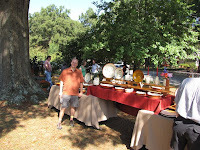 I went to the Circle of Eight Fall Sale on Saturday. I got there an hour late and left three hours late. 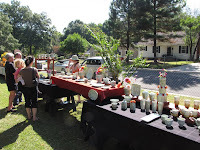 I really enjoyed being there: The pottery was great, the people were wonderful, and the weather was perfect. 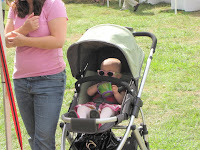 Everyone seemed to be having a great time and it was nice to just let it all soak in on a nice day outside. 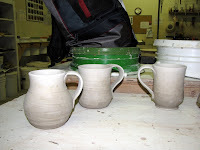 After soaking up all that fun and inspiration I pried myself away from the sale and went to Clayworks to handle some mugs and trim lids for my casseroles. Amy showed me her studio. 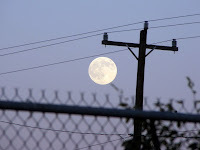 to catch the big, full moon.